Capture your love for the home team with the new, limited edition Mascot Collection, now available for you and your Customers! This limited edition Mascot Collection is available while supplies last and is the perfect complement to the new Fall/Winter 2018 Collection! This collection gives you the chance to reach out to the sports moms in your life, the booster clubs or your alumni friends who love to show their school spirit! The Mascot Collection includes popular mascots captured in little Charms: the bulldog, the panther/jaguar, the bear and more. 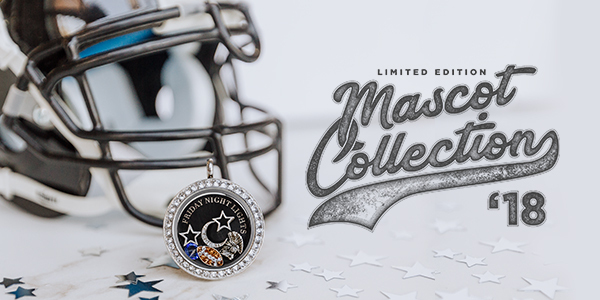 Plus, there’s a Sports Finger, sparkly Football , two new Plates and our other team Charms and colorful Swarovski® Stardust Crystals and Birthstone Crystal Charms! Flyer added to your Back Office under Designer Resources > Designer Resource Library. And what’s OWL-some about the timing of this new collection? Fall sports teams are ALL thinking of ways to raise money to cover sports equipment, event costs and more. Why not reach out and start a fundraiser with your business? It’s a great way to be a Force For Good® while also growing your reach (and your business!). Watch O2 Leaders Lisa Weinbrecht and Tami Butcher’s breakout session from The O2 Experience on how to put the “FUN” in “fundraisers.” You can also find this video in your Back Office under Designer Resources > O2 Training Academy > 2018 O2 Experience Convention Training. Get out there and share this limited edition, sporty collection with your Customers!